Back in October I had the opportunity to attend SIEGE 2016 in Atlanta, GA. This year was the 10th year of the annual Southern Interactive Entertainment and Games Expo, an industry event for game developers bringing together professionals, academics, executives, government officials and more from across the region to celebrate the world of gaming. 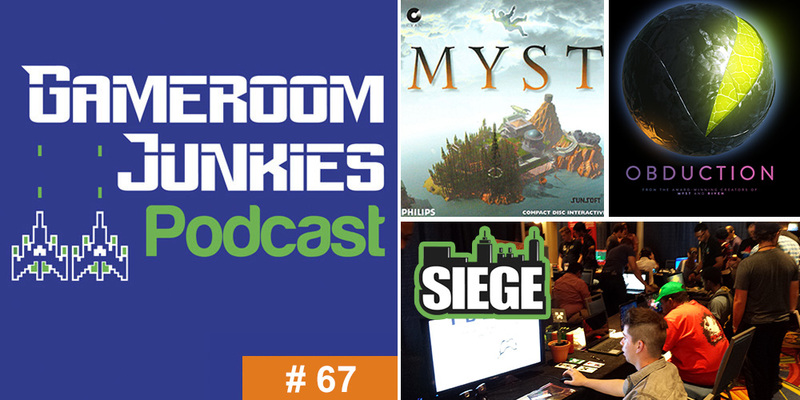 In this special episode of Gameroom Junkies, we bring you two interviews from SIEGE. The first interview is with Steven Singler of SIEGE who talks about the event’s evolution as a destination for game developers looking to break into a competitive industry, and the second is with the keynote speaker Rand Miller. Even if you’re not familiar with his name, you’re probably no doubt familiar with the game Rand Miller designed and directed with his brother Robyn. Myst was a revolutionary game of discovery and one of the best-selling games of all time. In this episode of the podcast you’ll hear the interview with Rand Miller recorded at SIEGE where he talks about his early days designing games and founding Cyan, hitting it big with Myst, and about his newest creation, Obduction. Don’t forget, you can listen to Gameroom Junkies by using the streaming player above, or you can subscribe to us on iTunes or Stitcher. If you like the show, please leave us a review. And remember, you can help support the show and save 10% on your next PinballBulbs.com LED purchase by using the code “gameroomjunkies” at checkout. You can find us on social media though Facebook and Twitter. We hope you enjoy the show and remember, if you enjoyed the show and the other GeekDad podcasts, please consider throwing a few bucks into the GeekDad Patreon.